I believe that the Great Sign in the Sun, Moon and Stars on September 23, 2017 literally fulfilled the vision John was given in Revelation 12:1-2. This is perhaps the most exciting prophetic sign our generation has seen (apart from Israel’s rebirth!). Israel’s rebirth seems to have fulfilled the sign of the budding of the Fig Tree, and thus, the starting of the so-called Terminal Generation– the generation that will not pass away until Jesus returns. The Revelation 12 sign seems to be right on time to signal the imminent rapture of the church and the beginning of the Time of Jacob’s Trouble. This time of trouble will bring about the reconciliation of Israel to God, through a period of severe testing. Luke is describing the beginning of the birth pains in that passage, and states that when these things begin to take place, straighten up and raise your heads, because your redemption is drawing near. (Luke 21:28 ESV). God intentionally gave us the sun, moon, and stars to mark out the days, seasons, and years – these are the cogs in God’s timepiece. Interestingly, the sun, moon, and stars “proclaim knowledge” and also serve as signs. God placed the heavenly bodies deliberately with specific orientation, alignment, and order. God wrote the story of salvation in the stars via the Mazzaroth (which satan corrupted into what we know as astrology). Because other watchmen have detailed this sign so well, I’m going to just summarize the best articles I have found and point you towards further research if you are interested. The information on this sign has literally exploded all over the internet! The Revelation 12 sign was first discovered by Luis Vega in 2008 using astronomy software. This discovery came on the heels of Rick Larson’s 2007 documentary entitled The Star of Bethlehem, which used astronomy software to locate the stellar sign heralding Jesus’ first coming. The Star of Bethlehem documentary sparked a new interest in looking for prophetic signs in the heavens. Although there were several prophetic watchmen who looked into the Revelation 12 sign before him, Scottie Clarke has become somewhat of a poster child for this great sign over the last 6 years. His discussions can be viewed on his YouTube channel – eternalrhythymflow. Many other Bible prophecy watchmen have since verified the sign in Stellarium and other astronomy programs as well. Today, thousands (if not tens or hundreds of thousands) of people have verified the Revelation 12 sign which will occur on September 23, 2017. Rev12Blogspot has written up detailed instructions on how to view it for yourself, if you would like to check it out. For a detailed discussion on the components of the Revelation 12 Sign and common questions and answers, I suggest you go HERE (unsealed.org). This PDF Document is a detailed discussion on the sign and I highly recommend printing or saving it: Revelation 12 Sign of September 23, 2017. The linked article gives a summary of the astronomical alignment that will literally come into the exact position described in Revelation 12:1-2 on September 23, 2017. This sign is seen from the perspective of Jerusalem, Israel, which is at the epicenter of all Biblical prophecy. Some people have said that the alignment is not a big deal. I decided to take some time to do the math. Let’s calculate some odds shall we? I’ve been conservative in my estimates so please correct me if I’m wrong. The Moon travels through all 12 signs about every 28 days. So the odds of being in Virgo in a year is about 1/12. While the moon is in Virgo (about 4 days) its at the feet for only 1 day so we get odds of 1/4. The Sun clothing Virgo happens about 4 days out of the year so we have odds of 4/365. Jupiter travels through all signs once every 12 years so we have 1/12. Mars takes 2 years to go through all the signs and stays in Virgo for 1.5 months which is 1.5/24. Mercury takes one year to go through all the signs so we have 1/12. Jupiter is in retrograde about 4 months of the year so we have 4/12. Jupiter is in retrograde over any single sign is about 1/12. The odds are about 1 in a HUNDRED BILLION. 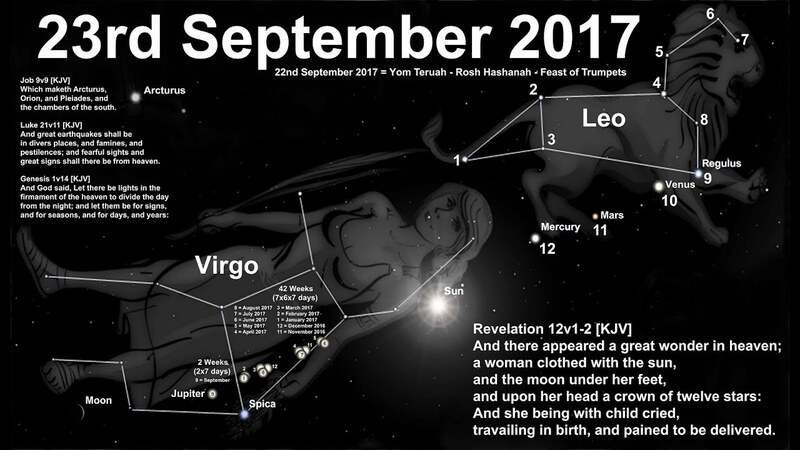 The Great Sign appeared over Israel on September 23, 2017, which also happened to be a Saturday, the Sabbath day. It wasn’t just any Sabbath, however – it was the Sabbath of Return. Shabbat Shuvah is the Sabbath that occurs between Rosh Hashanah and Yom Kippur and marks a time of reflection leading up to the Day of Atonement (Yom Kippur). On it, the Jews read Hosea 14:2 “Shuva Yisrael – Return, O Israel, unto the LORD your God!” The Sabbath of Return occurs every year as part of the celebration of the Fall Feasts; however, this year it seems significantly punctuated by the Great Sign. Will the exit be before the sign? Will it be on the day of the sign? Will it be shortly after (days, weeks, months, one to several years)? This remains to be seen. It is God’s will that we all live in a state of alert spiritual readiness. This demonstrates the beauty of Biblical prophecy! It is alive! Each generation can use it for profit, but it becomes more and more meaningful as it unfolds. Who is the Male Child? September 23, 2017 in 3 Minutes! How Rare is the Sign?